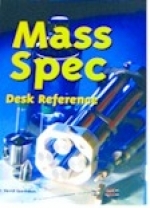 "Mass Spectrometry Desk Reference" by O. David Sparkman (2000, 1st edition) ISBN 0-9660813-2-3. Paperback. The recent explosion of applications with mass spectrometry to solving problems in chemical and bioanalytical analysis requires scientists from all disciplines to become conversant in the language and symbolism of mass spectrometry. Failure to do so may result in confusion, misrepresentation, and significantly diminished communication; both written and oral. This concise desk reference is compiled to give newcomers and seasoned practitioners the information they need to be successful for communicating ideas and results.